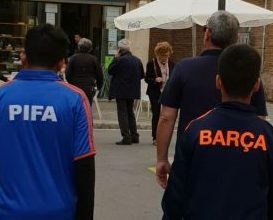 The PIFA Champions Tour 2018 was held in the suburbs of Barcelona. May 14 -23, 2018. The 39th tour in 15 years. Twenty four boys & three girls participated in this 10-day football camp. The campers came from Mumbai, Pune, Ahmedabad & Hyderabad. These camps do not require any selection, anyone that wants to improve their skills, experience European football training and lifestyle is welcome to join this tour. The campers were trained every day by UEFA Pro Coaches Mr Manolo Marquez, head coach of Division 1 – Las Palmas and Mr Francesc D’Asis Bosch Farres. The senior campers played a friendly against the local U19 champions Sant Miquel D’Olerdola CF, while the Junior campers played Escola De Futbol U15 team. The campers also celebrated the AFC Grassroot day with fun and challenging games. The campers got to meet Borris Garros, a striker from the oldest Spanish Club Recreativo Huelva, who shared his experience of what it took him to play competitive football in Spain. The campers got a tour of Barcelona City, Sitges a fishing town and Vila Franca. They also visited the FC Barcelona stadium Camp Nou and the Museum. The highlight of this tour was watching the last La Liga match of the 2017-18 season between FC Barcelona and Real Sociedad (1-0, Coutinho) at Camp Nou. It was also the farewell game for captain Andrés Iniesta, the match was followed by a farewell speech by Iniesta, followed by a party to lift up their 25th La Liga Trophy. It truly was the Champions Tour.